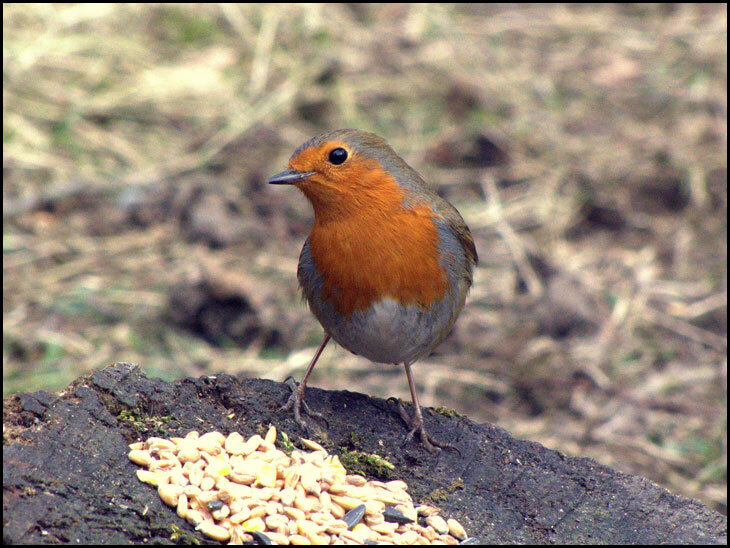 Lovely photo Ron, there is nothing like an English Robin. How much does it cost you for seed ??? Lovely Ron.....always nice to see Robins....cheers!!! ....and he's just as cheerful in the Spring, as in the Christmas season! Maybe that's because he has a good meal in front of him! Thanks,Ron. My goodness! That's two birds and a horse, in only ten days! Watch for adverse comments! Beautiful photo Ron. Robins are some of my favourite birds. Pretty as a picture Ron..a sight for sore eyes. Sorry to disappoint you Ellen lol. Who can resist a Robin? your right ellen ive noticed animals creeping back on piccy a day. get a grip if i want to look at animals i'll look through nat geo mag. Ron, where in Haigh Hall is this Hide situated. Good shot Ron, well done. MarieM .Just up the path from the model railway.close to the miniature railway station. Thank you Ron. I will have a look next week. Not up to your usual level,DH. did you run out of snide??? Lovely bird nice picture ron.